Adding individual locks into your work makes a beautiful and dramatic creation. Shepherds Talk has created a method for adding beautiful long wool locks (Wensleydale, Teeswater, etc) directly into your work. 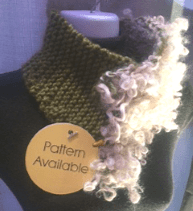 Included is a short video tutorial on how to purl your locks into a project and a pattern for a neckpiece. This pattern is NOT included in our 'Ideas for Naturally Textured Yarns' collection.